After the visit to the hospital on Friday evening, Joseph was sick again on Saturday. Then on Sunday he had no sickness and no fever. However, he was only able to take fluids as his tummy was so edgy that he was not interested in solid food. On Monday Joseph took a few light things – a bit of rice, things like that and made it another day with no fever and no sickness. Because Joseph had not been sick for over 36 hours he went back on oral chemo Monday night. By Tuesday he was starting to catch up on his food. He was really hungry after about a week with no solid food. Once the doctor had said that I remembered that last year we kept waiting for Joseph’s neutrophils to come up enough to come home from the hospital after his intense initial treatment and I asked what could cause neutrophils to stay low and the most common answer was “a virus”. Here Joseph clearly had a virus, YET his neutrophils actually went UP to help his body fight the virus. So here we were with Joseph not feeling well, many people praying and Joseph’s body working far better than would normally be expected to fight the virus off. Here there was a physical army totally surrounding a city and of course people felt helpless and afraid. But when the prophet saw that his own servant was afraid he asked God to open the young man’s eyes. A strange thing to request as the young mans eyes were working just fine – he could see the army all around the city with no problem. But the prophet was talking about was spiritual eyesight, the ability to see the reality that was all around them that was not normally visible. What he saw was an angel army that was immeasurably more powerful than the human army that surrounded their city. Suddenly the young man could understand that what seemed like “reality” was superseded by a spiritual reality of which he had been unaware. Many people speak of being “realists” and dealing with life “as it is”. However, this young man found that there was a lot more to “reality” than he ever imagined. During the day on Thursday Joseph was able to drink water but not able to hold down solid food of any kind. He then slept very well Thursday night and Friday morning was able to have a bit of toast for breakfast and has been drinking water throughout the day. About noon we noticed that Joseph was uncomfortable and we took his temperature, which was 38.8C. His safety threshold is 38C so we called the hospital. They suggested that he continue drinking fluids and take rest and be given some paracetamol. If the temperature were to come back up, or he was to be sick again, we should call back. Then after having a good nap Joseph got up for dinner. We were at the table and he had a couple of bites of something light and was immediately sick. We took his temperature and it was back up to 38C again. After calling the hospital again they said it sounded like it was still the virus working in his system but that for safety we should come in for a check up. 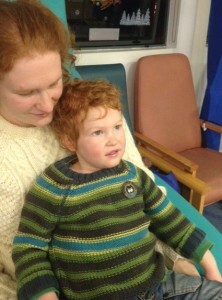 So I am writing this from the hospital as Joseph is having a blood test done while sitting on Kate’s knee. Today, Marie, Kate’s mum came by for a visit and is able to stay with the other boys while we are here for tests. We have our suitcase in the car should we need to stay but are hopeful that we will be able to go home if there are no secondary infections. 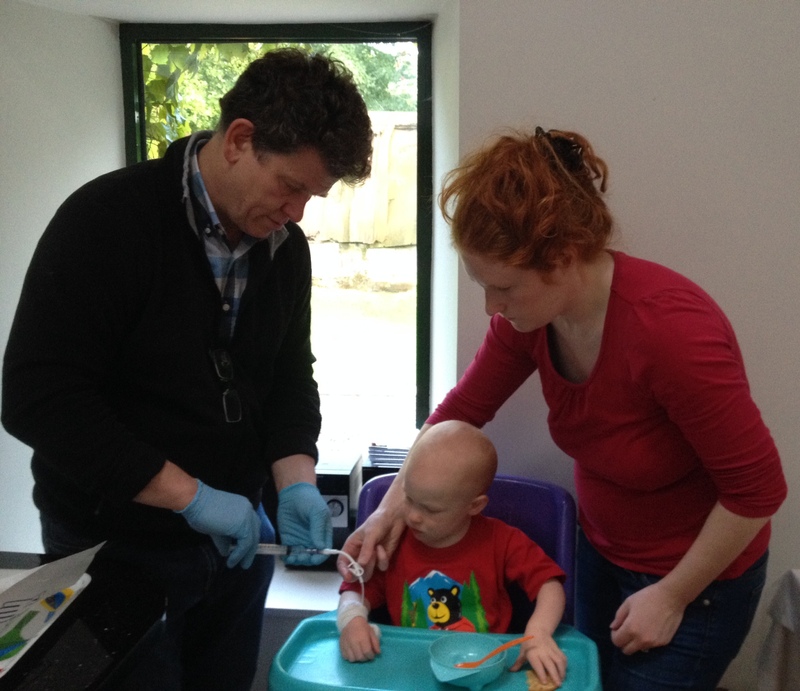 Joseph needed to have an canula inserted into the back of his hand so that blood sample could be taken. The doctor and nurse commented on how Joseph did not wiggle, flinch or cry when this needle was inserted into the vein on the back of his hand. Then later the doctor needed to have Joseph stick out his tongue so that he could see the back of his throat. Joseph managed to move his tongue in every direction but the right one. Later Kate and were talking about that and came to the conclusion that we had never taught him how to “stick out his tongue” so he really did not know what to do in response to that request. 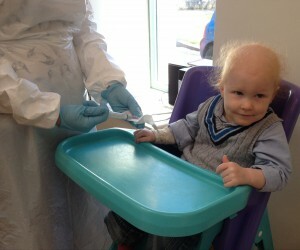 Joseph’s blood results are now back and show that he is able to continue fighting the virus without being hospitalized. It is midnight and Joseph is very tired and looking forward to his “wee bed”. Our prayer request would be that the virus would leave his body soon so that he will fully recover. We are back from several hours in the hospital and much encouraged. The haematology clinic ran a full blood count and full blood analysis on Joseph and found that there was nothing life-threatening going on. Joseph was close to being dehydrated, so the doctor prescribed a powerful antiemetic (anti-nausea drug). Once Joseph was given this he was able to drink some water and eat a piece of toast which have now stayed down for 8 hours. 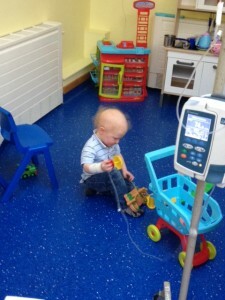 While still in the treatment room Joseph began to feel better and started to chat with the nurses. Once again the medical staff were amazing to us – very compassionate and thorough. When it was time to go home one of the nurses offered to stay with Joseph while I got the car, which was parked about half a mile away from the hospital due to the heavy traffic and no parking places in the afternoon. It was pouring down rain with wind gusts of 60 miles an hour. Joseph sat and chatted with the nurse about penguins while I collected the car. Joseph fell asleep on the way home. 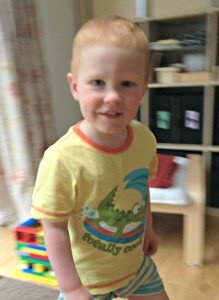 When we arrived I helped him change into his pyjamas and he was ready for bed. Just as I was tucking him in I set a basin by his bed just in case he was sick later tonight and Joseph looked at me and said, “Daddy, I will not need that tonight,” then rolled over and fell deeply asleep. With tears in my eyes I told Moses that he had it just right – the Bible tells us to never stop praying, that God never tires of hearing our requests. For all those who prayed for Joseph for his lumbar puncture, he did very well. He did not complain of hunger or thirst in the fasting time and came through the procedure very well. 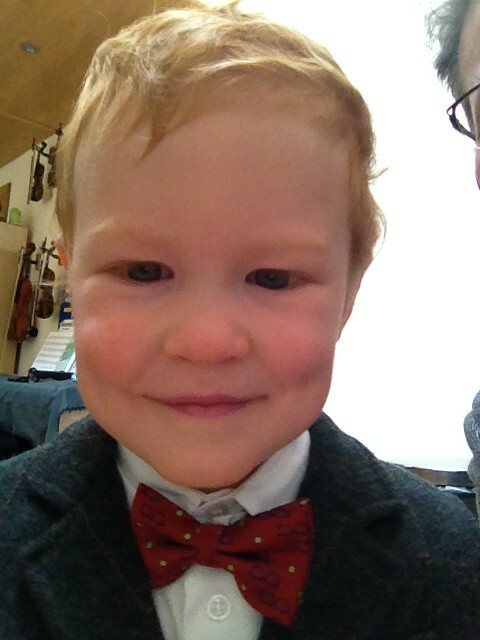 We are posting this quickly today because Joseph will go in for a check up in an hours time. The tummy bug ran through our house two weeks ago and Joseph did not have any sickness at all. We were amazed at how he got through that time. Now, two weeks later Joseph has been sick (vomiting). He is having a hard time keeping food and fluids on his tummy. We will go in for check up and a blood test where he can be isolated and not place other children with compromised immune systems at risk. Joseph really has not been ill this past year, so this is a big change for him. There is every reason to hope that this will pass with no serious consequences but because of Jospeh’s weakened immune system we take anything like this seriously. Please pray that Joseph will soon recover from this and it have not long lasting effect. Please pray also that he does not develop any secondary issues due to his weak immune system. This afternoon I think back to Jairus in the Bible who sought out Jesus when his little girl was sick. Jairus knew that Jesus was full of compassion and He was not just a last chance for his little girl but the best person they could reach out to. Jairus recognised that he had no power to help his child, but he also recognised that Jesus was fully able to do anything. So Jairus’ response to this situation was to humbly ask for Jesus help and we think that was a great idea. So we too humbly ask for Jesus’ help and would ask that you would do so as well. Thank you for your prayers for Joseph. Answer to Prayer: Joseph has been sleeping much better – thank you for your prayers. Prayer Request: Joseph has a Lumbar Puncture scheduled for the 10th of November, please pray that he will have grace for the fast that day and that he will tolerate the chemotherapy of his spine well. It has been just over a year since Joseph was diagnosed – that occurred on 21 October 2013, four days after his younger brother, Ezra, was born. With one full year of treatment behind him and two more years ahead, we have been taking some time to reflect on God’s goodness to Joseph. When he was diagnosed with Leukemia, Joseph was also found to have a deadly infection that there really was no way to treat. We cried out to the Lord and asked people to pray that the Lord would preserve Joseph. In response to that request, thousands and perhaps tens of thousands of people in over 20 countries prayed for Joseph. 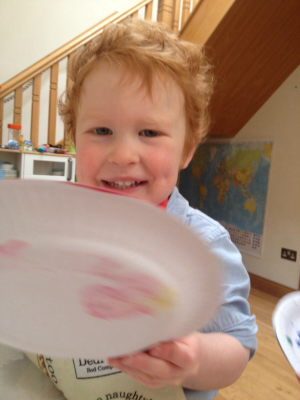 What has been just as amazing to us a year later is the number of people who still pray for Joseph on a regular basis. Everywhere I go I am greeted with the same question “How is Joseph?” and that is soon followed with “I am praying for him” or “My Bible study is praying for him”. Does that prayer matter? Is it not, at this point, just a medical issue? Well, for a year we have had a bag packed by the door so that we can go the hospital, day or night, should Joseph develop any type of infection. Yet, even when Joseph was in his most intense chemotherapy and was expected to acquire an infection, he did not. 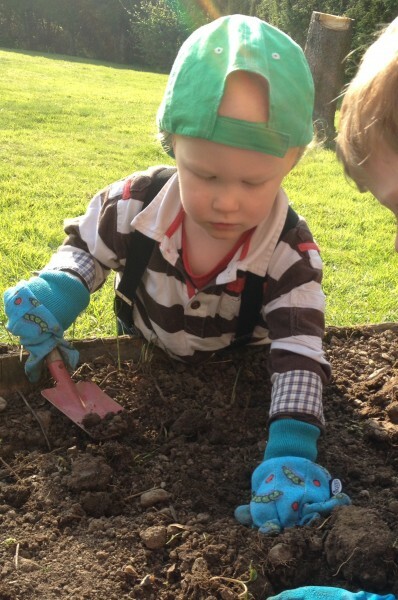 Over this past year there have been several times when Joseph’s immune system was not just suppressed but almost totally shut down – yet each time he was spared an infection. Even this week, one of Joseph’s brothers woke up in the middle of the night with a fever and vomiting. All the boys share a room and our first thought was – “Lord, please continue to protect Joseph”. We placed the sick brother in my home office and monitored his fever. With two days of sick tummy and intermittent fevers we were just waiting to see if it would spread though the family and to Joseph – yet the sick brother rapidly recovered and no one else has gotten ill. Along with all that prayer has been much help from the Body of Christ, His church. In the first weeks of Joseph’s illness, members of the church we attend brought us meals every day, washed our clothes, ironed shirts, cleaned our home, made the beds, helped care for our other children when Kate could go to the hospital, sent encouraging notes and texts, even donated blood to the hospital when they realized how critical this was to Joseph and other children like him. Since then many have continued to check on us and encourage us. Often people are concerned that it is very hard for us to get a break as a family – for where could you go with a child with a suppressed immune system? But again an amazing provision was made. 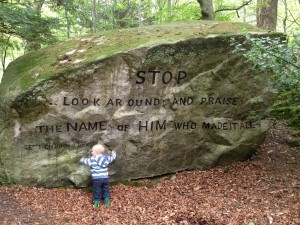 Here in Northern Ireland there is a retreat home that has been purpose built for families who are dealing with cancer. It is a state of the art facility – the only one of its kind in all of Europe and it is about a hour’s drive from our home. We were recently able to have a week there and it was great for our family and safe for Joseph. While we see the Lord as the one who has sustained and provided for Joseph this past year, we are grateful for the outstanding medical help the Lord has also provided. We live 10 miles from THE treatment center for Leukemia in Northern Ireland. Joseph’s medical team is a top group of specialists (consultants – UK) and all the medical personnel know Joseph by name and greet him each time he comes to the hematology clinic. Rather than being frightened by going to the hospital for check ups, Joseph looks forward to going to see his friends the doctors and nurses. All of these things remind me of the events in I Samuel chapter 7, when the people of God were faced with certain destruction at the hands of their enemies. Yet they worshiped God in this time of great distress and God came to their help and preserved them from their enemies. 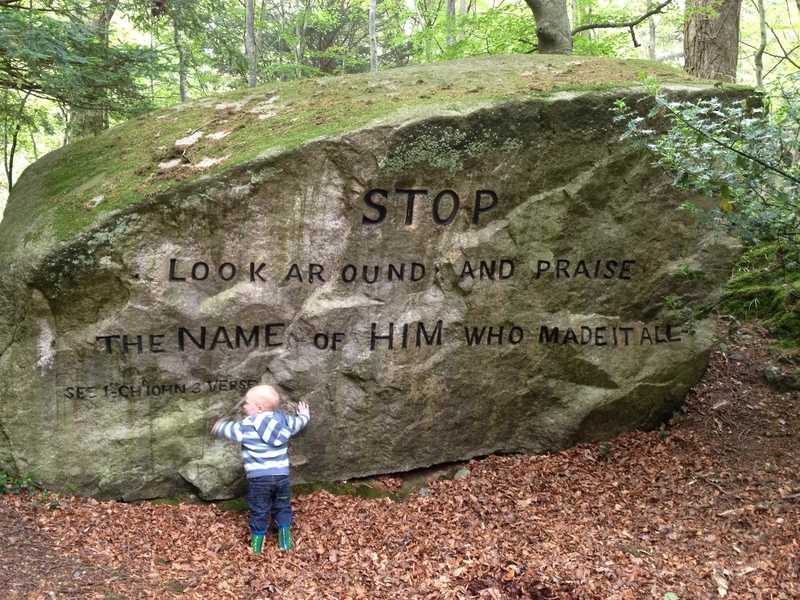 This was such an astounding deliverance that the people set up a monument – a stone pillar, and called it Ebenezer, “stone of help” or the place where God helped us. It was not because the people were so good that God rescued them. Actually, they had a long run of really sinful behavior. But God preserved them because HE is good, not because they were good. The world is deeply broken by our sin and the sin of everyone else. Because of that sin terrible enemies like Leukemia destroy lives everyday. Yet Jesus came to pay for all that sin and offer a way of escape and new life. It was not because we were good that He did this, but because HE is so good. Prayer Request: Joseph tested at the bottom end of the therapeutic range on his neutrophils today. He is again extra susceptible to infection – so please pray that he will once again be preserved and not have to go to the hospital. Joseph does not get to go a lot of places right now so when he does go out he likes to look his best. This morning he was looking forward to seeing his friends the doctors and nurses at the hematology clinic. 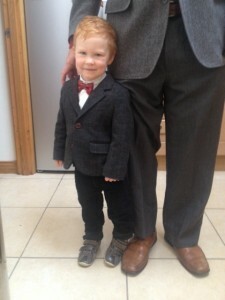 Many people commented about how good he looked and it was fun for Joseph to have so much positive attention. But when we had our check up with the doctor, Joseph’s neutrophils were at the very bottom of the treatment range for his chemo. So this very active and fun loving little boy was walking around with very little immune system. Of course Joseph was not bothered by that news. He was ready to go home and play. Over the past few weeks we have noticed that Joseph really struggles to get to sleep at night and he often wakes up several times during the night. There does not appear to be any specific reason for this – it could be a side-effect of his daily chemo, or it could simply be a result of being a 2 year old – but we are praying that he will soon be able to enjoy more restful nights. We continue to be amazed at just how well Joseph did during his last Lumbar Puncture on 18 August. That day he was to fast half the day and normally I take him for a walk in a baby stroller and he falls asleep for most of the time. But this time he was very alert and wanted to play. So we went to the waiting room for the out-patient surgical theater and Joseph quietly played for over two hours and never mentioned wanting anything to eat or drink. Once I was called to the recovery room I saw Joseph sitting on a nurse’s knee chatting away. Soon he was ready to walk to the car and go home. This type of recovery is not the experience of everyone. I have seen other children very disoriented, sore and staggering. It would be easy to say that Joseph was very strong and resilient, but really he is a little boy who has received much grace from Jesus. What we have seen in Joseph’s life reminds me of this verse of Scripture. God’s power has been sustaining Joseph through the prayers of so many of His people. It is not about our faith or about Joseph being a courageous little boy, but it is all about displaying God’s greatness, kindness and power. Highlight: Joseph’s line was successfully removed and he has been preserved from infection despite having almost no immunity several times. Prayer Request: That the balance between Joseph’s bone marrow and the chemotherapy would stabilize; for continued protection from infection; and for protection during Joseph’s next lumbar puncture on 18 August. 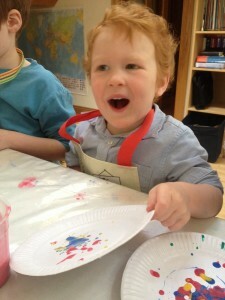 Thank you for praying for Joseph on Monday 9 June. He had a successful lumbar puncture and protective treatment of his spine and central nervous system. The doctors were also able to remove his semi-permanent line. When I went in to meet Joseph after he woke up from the anesthesia I found him chatting with the nurse and drinking a bit of juice. Joseph looked down and found that “Mr. Wiggly” was missing from his arm and a new big bandage was in his place. I explained that “Mr. Wiggly” was all done and that Joseph did not need him any longer. I was not sure how Joseph would respond to this sudden change. However he was ready to go home and tell his brothers about “Mr. Wiggly” being gone. Once Joseph’s wound healed from “Mr. Wiggly” being removed we decided to move Joseph back into the room with his brothers. This was a big change from being in an impromptu extension to mummy and daddy’s bed. We were not sure how Joseph would adapt to being with “The Big Boys”. Yet, within a couple of nights Joseph was sleeping through the night. He was one of the Big Boys again and everyone was happier. All along we continued to go in to the hospital every week or fortnightly for Joseph’s check up. 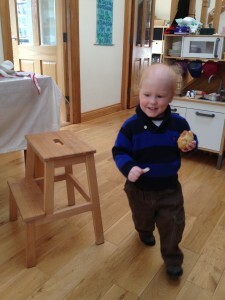 A few weeks ago the results from Joseph’s blood test showed that his blood was moving back to a normal healthy range. This was a sign that his bone marrow was starting to recover and it is a signal to the doctors to increase the dosage of his oral chemo drugs. 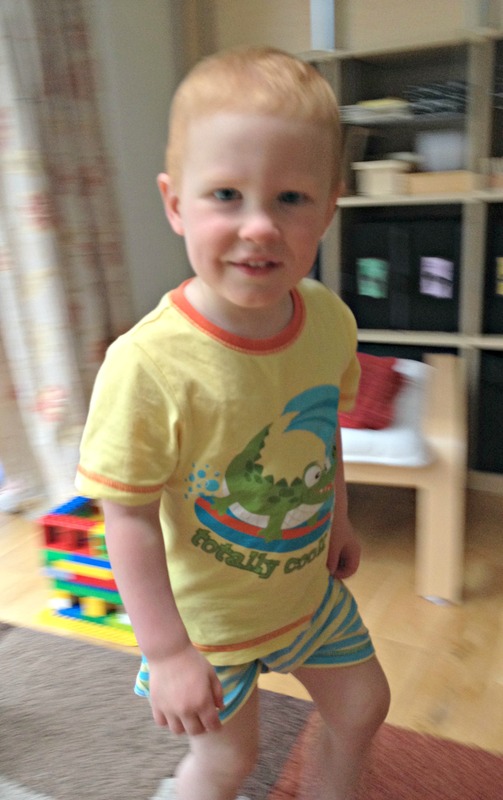 After a week on the new dosage level, Joseph’s neutrophils crashed to 0.3. Anything below 0.5 means that he is at extreme risk of infection. 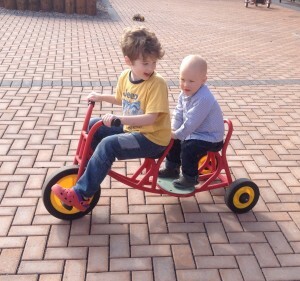 Joseph was given a “chemo holiday” where he is taken off all his drugs to allow his body to recover. At home we double checked the packed bag we always keep by the door should be need to take Joseph to the hospital for an infection. However, the Lord sustained Joseph again and he did not develop an infection. 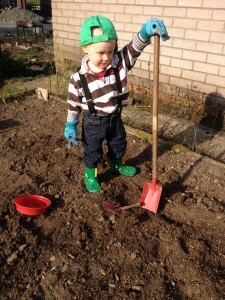 During that week the weather was lovely and Joseph and his brothers were very active outside. 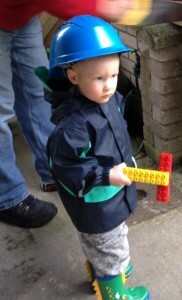 Joseph even helped me with a small woodworking project. 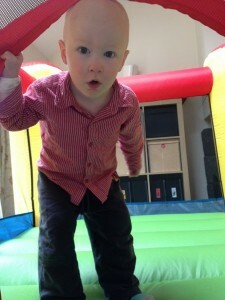 The next week we went back to the hospital to have his check up and his blood levels were back in “therapeutic range”. If a normal heathy person had these same numbers they would be considered VERY ill. However, for Joseph this is just the place they would like to keep his blood levels and the chemo drugs were started again. The reason for this constant treatment is that the doctors know that even though no leukemia can be detected in Joseph’s body now, there are very likely a few rogue leukemia cells roaming about his body. The chemotherapy is designed to kill those cells and prevent them from multiplying. If the pressure can be maintained on the leukemia cells then eventually every last one of the rogue cells will die off and his bone marrow will be able to grow back without any leukemia. That is the reason that Joseph has more than two years of additional treatment ahead of him. After a week on the lower level of chemo we went back in to the hospital for another check up and Joseph’s neutrophils had crashed again – this time to the level of 0.1. Joseph was put back on a “Chemo holiday” and as I walked out of the hospital with him I wondered if we would be back that day or the next as the result of an infection. Yet, again the Lord sustained and preserved Joseph and he did not get ill. All that week Joseph was happy to play outside and we enjoyed seeing his hair starting to grow back in. It is coming back in RED! And though still quite short, we think there is a bit of curl as well. This past week Joseph has been put back on his lower dose of oral chemo again and his latest blood test shows him to be safely in the therapeutic range. It will be another full week before we take Joseph in for another check up and we pray that his neutrophils do not crash again. We asked the doctor if all of this fluctuation was normal and she told us it is very common for children to respond this way to treatment, especially this soon after intense chemo – the healthy bone marrow is still quite “fragile” and seeking to become well established. What is not normal is how Joseph has been able to repeatedly have in essence no immune system and NOT get an infection. Once neutrophils are 0.5 or less it is very common for the normal bacteria that live in our bodies to run wild and cause an infection. The Lord has been sustaining Joseph and we thank each one who continues to pray for him. Joseph has been sustained so often that this exceptional situation almost starts to feel normal and that reminded me of the people of Israel in the desert after they were released from 450 years of slavery. For 40 years something like one million people traveled about in the wilderness with no source of food or water. So, roughly, we can estimate that God was supplying 500,000 kilos (or about 1 million pounds) of food and 3,000,000 liters (about 750,000 gallons) of drinking water each day. That does not count water for washing, or food and water for flocks of sheep or other animals. Today it is common for people to dismiss this miracle that went on for 40 years as a type of mythology. But is it? The Bible tells us that God feeds the birds of the air, and because of that we should not worry about where our food will come from. No one knows how many birds there are in the world but one estimate is about 300,000,000,000 – 300 Billion. These birds would eat roughly 7,500,000,000 kilos (roughly 15,000,000,000 pounds) of food each day, which is more than all the people in the world eat each day. Yet this food is not planted, tended, harvested or stored. What God does is of such a grand scale and is so pervasive that it becomes easy to forget how extraordinary it is. Instead of standing in awe of what God does on a daily basis we tend to see it as ordinary. If we will but look, we will see the hand of a loving God who is caring for us in a multitude of ways every day. Highlight: On Monday the 9th of June, Joseph will have his next lumbar puncture with chemo treatment of his spine. If possible they will also look to remove his semi-permanent line. Please pray that Joseph does well during his time of fasting, has no reactions to treatment, and has no complications with the removal of his line. It has been seven months since Joseph was diagnosed and he has been doing well these last few weeks. After delayed intensification was complete all of Joseph’s hair fell out. He also had very low neutrophil counts for a while as well. However, Joseph did not get any infections. As Joseph stabilized we received a visit from the NICFC (Northern Ireland Cancer Fund for Children). They offered us a week at their new family retreat facility to get a break and refreshment. Joseph still has to take oral chemo every day and has a suppressed immune system and that means we cannot take him near crowds. What was amazing about the new NICFC facility is that it was designed for families with children like Joseph. It is not often in life that one runs across a sign that weighs 50 tons telling you to remember that everything was created by Jesus. Yet Scripture tells us all of creation is saying exactly that all the time. It reminds us that when we marvel at the stars at night, the ocean, the mountains, or are in awe of a butterfly wing, we are really admiring the creativity and beauty of the mind of God. It was this same mind who communicated to us through the Bible His kingship and our need for salvation from sin and brokenness. But since we like to be the king of our own lives we tend to either worship the creation or worship ourselves. How empty we make our lives and our souls when we close our ears to the shouts of His creation to worship HIM. Will this be the last time we care for Joseph’s line? Highlight: This morning Joseph received his last IV chemo treatment of this intense block. He has been active and fever-free. Prayer request: Praise God for his mercy and kindness to Joseph during the past eight weeks of Delayed Intensification. After all the chemical warfare on Joseph last week, we were looking forward to a quiet Easter. 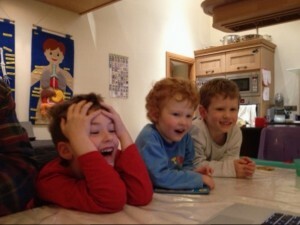 However, all the other boys came down with really bad colds – sore throats, sneezing and coughing. On Friday we took the older boys to the doctor to make sure that they did not have bacterial infections (which would be very dangerous for Joseph). That night the older boys had a fever and we were just waiting to see what would happen to Joseph. Try as we might to keep them separated, it seemed that every time we turned around someone had sneezed or coughed on Joseph. By Tuesday the other boys were on the mend and Joseph had a bit of a cough, but nothing like his brothers had the week before. When I took Joseph in for his blood test on Wednesday his neutrophils were high enough to continue treatment. 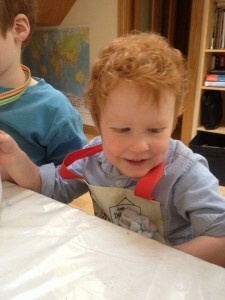 Today is Saturday and Joseph had another blood test on Friday just to make sure that he is in good condition. His results were as good or better than Wednesday! He still has a rough sounding cough but no fever and has just received his last IV Chemo treatment of this treatment block. 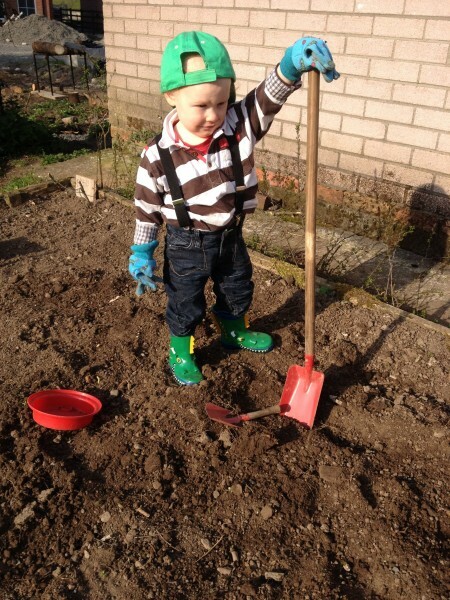 While treatment has continued Joseph has been very active with his brothers in many learning activities. One of those was an “archeological dig” in the garden for “artifacts”. These artifacts included a golf ball, a broken wireless router, a power cable, Duplo blocks, an old scarf, old ear phones and a toy frying pan. After the “big dig” the boys tried to reconstruct the civilization that would have produced these things and explain why they were found together. It was great fun, especially the theories of what each thing was used for and why people would have them! The boys facing the mystery of their “archeological dig” and our facing the mystery of Joseph’s leukemia reminds me of the confusion and mystery that surrounded the death and then resurrection of Jesus. The followers of Jesus were stunned that Jesus could be arrested, beaten and then brutally murdered. After all, he was GOD. How could this happen? How confusing it must have been for the demons who were rejoicing to see Jesus rejected and suffer at the hands of His creation, but then to also be rejected and stricken by God the Father. Why would God the Father pour wrath on Jesus that far exceeded all that man and demons could do? Then, when Jesus rose from the dead it caused as much confusion as his death. How could someone really come back from the dead? Why was he making his followers into teachers and servants rather than generals with armies? The angels had to be surprised that Jesus had eternally bound himself to a human resurrection body. And, even more mysteriously, that God was going to fully forgive sinful human beings and make it impossible for them to ever fall into sin for all eternity. This was not being done for angels. Yes, Jesus was everything that had been prophesied about the Savior and yet he was nothing like what people, angels or demons had ever expected. The same is true today. Jesus is not a character in an ancient religious narrative. He is Creator and Lord. Jesus is also living, real and personal. So we don’t just learn about Him but we have the highest privilege to meet and know Him. The greatest mind, deepest artist, and most compassionate soul of all is willing to know you and invites you into relationship with Him forever. Amazing! For the past two weeks Joseph has been on “holiday” from chemotherapy. 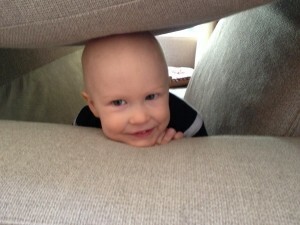 His neutophil count was down to 0.1 so he was VERY susceptible to infection. But the Lord preserved Joseph again and he was well the entire two weeks. You can see from the first photo that he was really enjoying his time off from chemo. 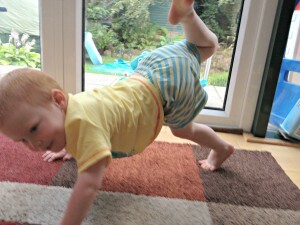 We found Joseph acting very much like he did before he was diagnosed. He was full of energy and liked to make wee jokes just to see if you were paying attention. On Monday Joseph’s blood count was good, with neutrophils at 1.2. So he was scheduled to start the second half of delayed intensification. On Tuesday afternoon I took Joseph in for his major infusion of this half block of treatment. Cyclophosphamide is a chemical decedent of nitrogen-mustard gas, a very powerful blister agent designed for use in warfare. An accident in WWII exposed several hundred troops to nitrogen-mustard and in the follow up medical care it was noticed that white cell production in the blood was suppressed. This led to the development of the very first “chemo” treatment for leukemia. You might guess that infusing a chemical weapon agent into your two year old feels a bit odd. The amount of active agent is tiny but the list of really horrible side effects is long. To protect Joseph from as much as possible, they infuse extra IV fluids both before and after the treatment to “flush out” excess toxicity. This made for a long afternoon and evening of infusion. In the second photo you can see Joseph playing while hooked up to his drip on Tuesday. 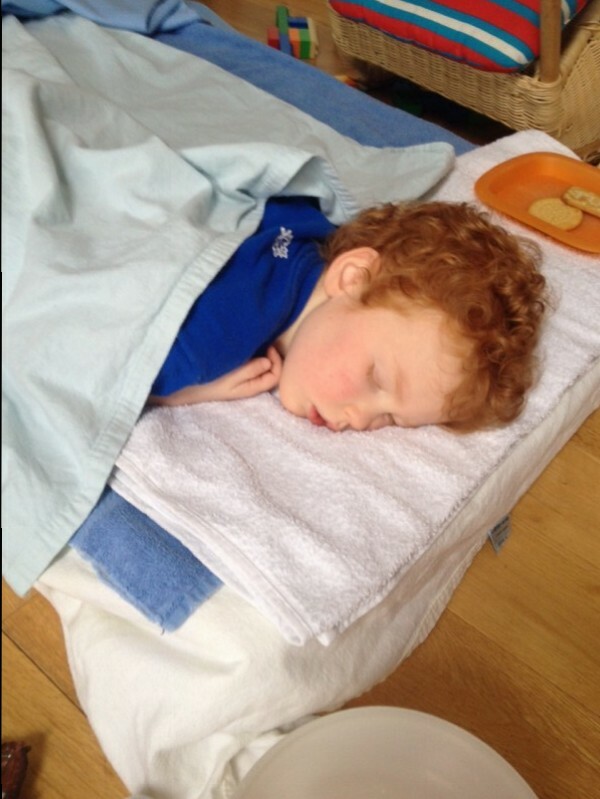 The nurses warned us that this treatment can really make you nauseous so Joseph was treated with an anti-nausea medicine before his infusion and we were told to make sure and give him doses morning and evening for the next two or three days to help protect against strong nausea. Joseph got two other drugs on Tuesday. One was Cytarabine, a drug whose active agent was originally extracted from Cryptotheca crypta, a sea sponge found in the Caribbean. Cytarabine is excellent at killing cancer cells but has its own long list of scary side effects. One of the less dangerous, but potentially inconvenient, ones is what is known as Cytarabine Syndrome, where the patient has a flu like reaction to the drug that produces a fever. This is not an infection but a type of drug reaction. Should Joseph have this reaction he would need to go into the hospital for 3 to 4 days of IV antibiotic treatment as it is not possible to tell the difference between a Cytarabine induced fever and one caused by an infection in the early stages. The last drug of the day was Mercaptopurine, something that Joseph has had before. It was specifically designed to fool replicating DNA into using it as a building block for a new strand of DNA. However, Mercaptopurine does not behave well when incorporated into DNA and kills the cell. It too has a significant list of possible side effects. All of these drugs share one property and that is they can have a serious impact on the immune system. So once again Joseph will be at high risk of infection during the last half of delayed intensification. When I read the history of Cyclophosphamide I was struck by the idea that something designed to maim and kill vast numbers of people would be used one day as a way to kill leukemia cells in children. It reminded me of Joseph in the Bible who was sold into slavery by his brothers. He would one day become a high government official in Egypt and would have the power of life and death over those same brothers. When confronted by Joseph, as a ruler in Egypt, his brothers were terrified. But then Joseph said that what his brothers intended for his harm, God intended for Joseph’s good and the saving of many lives. If scientists can turn a chemical weapon into a drug to help fight cancer in children, what might God do with things that look like they have no good purpose? Since God has all power, He was able to take the slavery, false imprisonment, disappointment and hardship in Joseph’s life and make him national level leader in Egypt and lay the foundation for a nation of over a million people that would come from his family in the future. The key was that Joseph really trusted God, no matter what happened. And so the challenge is for me to do the same. To really trust God that He can make something amazing out of our Joseph having Leukemia. To trust God that, no matter what comes into our lives, He has good plans for us, even in the hard and seemly senseless things. It is rational, I think, to believe that the One who spoke everything into existence is able to transform our scars into something beautiful. therefore in their land they shall possess a double portion; they shall have everlasting joy.